Armed with a tent peg mallet, Love Hearts, chocolate bars, saline wipes and bottles of water, the popular Latitude Festival Pastors helped spread peace and love across the sprawling canvas city in the fields of Henham Park in Suffolk. Keith Morris reports. This year’s Latitude Festival (July 14-16) saw up to 40,000 people arrive on the site from all parts of the UK, Europe and further afield to enjoy music from bands such as Mumford & Sons as well as ballet and comedy. They were welcomed not only by the iconic pink sheep but also by the Festival Pastors, who have been helping out at Latitude since the festival started in 2006, also dressed in their own distinctive pink high vis attire. 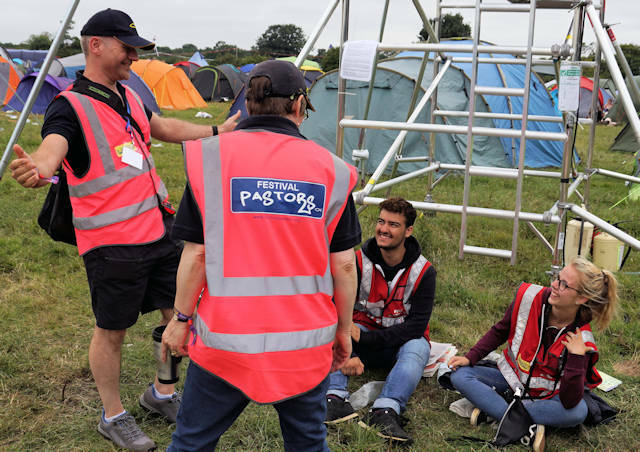 As well as serving the cheapest tea and coffee on site and a warm welcome in their café, the pastors patrol the vast campsite in pairs helping people put up tents, find lost friends and providing a friendly face. The pastors are drawn from around a dozen Town Pastor groups who regularly pound the weekend night-time streets of ten towns across Suffolk and Norfolk,such as Lowestoft, Felixstowe, Ipswich, Leiston, Dereham and Haverhill. Their aim is to bring a sense of calm and a caring touch to those festival-goers who find themselves in need of a helping hand. In just a single two-hour afternoon patrol, I witnessed old hands Richard Ward from Lowestoft and Liz Livey from Felixstowe make their mark. They cheered up bored security staff in their lookout towers by throwing Love Hearts up to them, helped search for a couple of lost children, took pictures for groups of campers, renewed old acquaintances from previous years and went to the aid of a distressed group of teenage girls who had had yoghurt thrown over their tents and tent pegs pulled up. The patrolling pastors are backed up by a team praying both on the site, informed by mobile phone updates on incidents, as well as a 24-7 prayer network across East Anglia. The 65-strong on-site Festival Pastors team also mans a café which, as well as tea, coffee and Pot Noodles, offers the chance to engage with a live art project including two residents artists. They also provide a listening ear and are happy to talk about any concerns punters may have or invite them to post them on a prayer board. Prayers for an aunt’s cancer treatment and a mum’s peace of mind and health were a couple of examples. Co-ordinator Jan Bedford, from Felixstowe, said: “We are here to listen to people who want to talk about life’s issues and that includes stewards and staff as well as the festival-goers. The patrolling teams operate in shifts from 9am to 3am at night, when they help sweep the main areas and make sure people get back to their tents safely. The Latitude organisers warmly welcome the pastors’ presence, as did everyone else I spoke to, and they certainly help add to the largely peaceful and enjoyable event. Pictured above are Festival Pastors Richard Ward and Liz Livey in action. Click here or see below for a full picture gallery.